Late winter beekeeping checks – What to do and what to avoid? What does a beekeeper do with bees in late winter? Are there jobs to do when the bees are tucked away in the hive all day? What are the bees doing in there anyway? 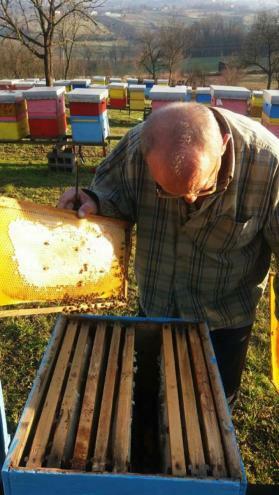 The beginning of the year is somehow wake up for our bees, but still hands-off for beekeepers. The bees keep their winter cluster intact, the queen begins to lay eggs, and brood rearing begins in the largest, healthiest hives. Days started to be longer and renewal of bees must begin, but slowly, carefully and thoughtfully. Peace is the only thing what the bee colony needs! At this time, it is often too cold for honeybees to fly and they know that. There is no consistent source of pollen or nectar for them to eat. Honey bees do not hibernate, they remain active inside the hive. Although the temperature outside may be freezing, the center of the winter cluster remains a constant 92 degrees F. The bees generate heat by “shivering” their wing muscles. However, bees should not just be “put to bed” in autumn and left to their own devices until the following spring; to do so it dramatically increase the chances of colony losses. Over the winter months, a beekeeper should provide adequate assistance for the bees in a way to ensure them a quite and clean surrounding. All other beekeeping activities, especially rocking the hive or knocking on its side, further wrapping the hives or adding supplement food like bee candy or fondant in this period of time (late winter) is not desirable to do. Actually, this premature actions can cause the expansions of brood what usually leads to deadly consequences for bees. Beekeepers in January and February should monitor their apiary and keep it clean, prevent harassment of bees of animals and people, and repair any damage caused by unwanted guests or natural influences. Managed honey bees, like all livestock, have various needs, so understanding honeybee biology and recognizing these requirements enables beekeepers to know what to do and when to do it. The only way that you can know what is happening to your colonies is by regular checks and notes. Record your observations for each hive in a book each time you visit; more reliable than a memory! Over the winter months apiary visits are made to make sure to remove dead bees at the entrance to allow live bees to escape for cleansing flights, to make sure that hive roofs have not been blown off; that hives are still upright, as they can be knocked over as a result of winter storms, stray animal interference or vandalism; to monitor varroa levels and if necessary carry out treatments typically in December or January using oxalic acid. Hefting hives, a skill all beekeepers should develop, will also indicate if you need to „emergency‟ feed. Lifting the crown board also enables assessment of stores which can be done in conjunction with a winter Varroa treatment, or on a frosty day when the winter cluster will remain intact. The boxes may also need protecting from woodpecker attacks as they search out bee grubs for winter food. In our climate and pasture conditions, in the South Eastern Europe, until the end of February or the beginning of March is not necessary and is not good to perform any action on bee colonies, which require the opening of their habitat unless it is really necessary to intervene in order to rescue the bee colony. Occasionally in January and February, there will be days when the temperature comes above freezing, when the sun is shining and the wind ceases to blow–these are the kinds of days you want when you have to open your hives in the winter. Have the bees got enough honey and pollen until the next visit? It is the responsibility of the beekeeper to make sure the bees have enough stores. If bees are starving at this inspection, there are several options of rescuing the colony. You can feed the colony with frames of honey. Check that the colony has 4-5 combs with honey/stores. You can feed sugar syrup using a suitable feeder or in extreme cases spray the bees with a thin sugar solution and then fill an empty comb with sugar syrup. You can feed the colony candy/fondant. Have the bees got enough room to expand the brood nest? Do the colonies need supers put on? Will they need supers at the next visit? Colonies of bees need room for both themselves, stores and to expand the brood nest. Congested brood nests will dictate a need to swarm. Getting the right balance of winter stores fed in the previous autumn is a major factor. Don‟t just feed bees - calculate their requirements and feed to create the right level of stores in spring. Is the colony Queen-right and headed by a young prolific Queen? Check that a queen is present. There is no need to actually see her, just make sure that eggs and brood are present. If you see her and there are no eggs or brood it could indicate a shortage of suitable stores including pollen, or that she is a young queen who has not started to lay. If you wish to mark and/or clip queens this is a good time to find her and do so. Do I need to change some or all of the frames and combs? Keeping bees in clean hives and on good comb reduces the risk of disease and makes management easier. With early spring checks old or damaged frames and comb put to the side of the brood chamber in the autumn can be replaced with new clean drawn comb providing you have a supply. It is very important to regularly replace brood comb as it prevents the build up of pathogens. When there will be time to do full inspections and clean, it is a good approach to do some spring cleaning such as scraping the top bars and crown board free of brace comb and other detritus. Better still clean the top bars and put the frames and bees into a clean hive on a clean floor board. If you do not have much spare equipment you can scrape out and lightly scorch the old hive and then use it for the next colony change. Hygiene drinkers are those in which the bees are below it when they taking the water, so in such a position can not be contaminated water. Hygiene drinkers are not and can not be drinkers for chickens or similar ponds that bees fly over and landed on them. If drinkers are not hygienic and if beekeeper can not maintain them regularly then it is better not to set them.